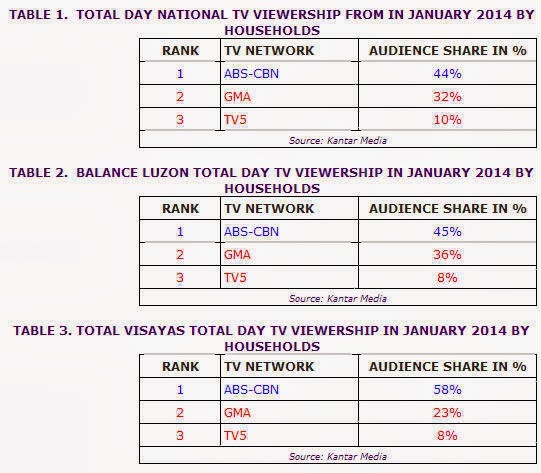 ABS-CBN Starts 2014 Conquering the Nationwide TV Ratings with Top-Rating Programs! ABS-CBN Corporation welcomed the year 2014 on a high note as more Filipinos across urban and rural households all over the country tuned in to its programs last January, with an average national audience share of 44%, or 12 points higher than GMA’s 32%, based on data from Kantar Media. The Kapamilya network also continued to rule in key territories, including Balance Luzon (all areas in Luzon outside Mega Manila), where it registered an average audience share of 45% vs GMA’s 36%. ABS-CBN even beat GMA both with a 35-point lead in Visayas (58%) and Mindanao (57%), leaving the Kapuso network behind with only 23% and 22% respectively. With ABS-CBN’s strong line-up of teleseryes, the network maintained its primetime (6PM-12MN) supremacy with 48% last January, or a solid 16-point lead against GMA’s 32%. Newest primetime offering “The Legal Wife” was off to a good start and rated high with an average national TV rating of 21.5%, ranking as the country’s eighth most viewed program in January and pounding GMA’s newly-launched program “Rhodora X” (11.2%). 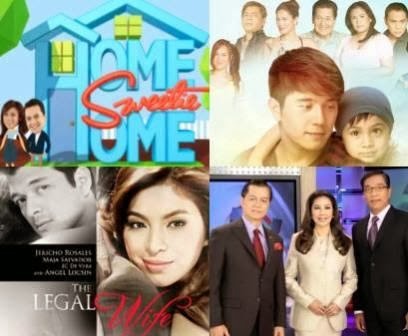 Kapamilya sitcom “Home Sweetie Home” (20.2%) emerged as the most watched program every Sunday, while “TV Patrol” (27.2%) is still the most watched newscast. The Kathryn Bernardo and Daniel Padilla-starrer “Got to Believe” continued to reign on its timeslot with an average national TV rating of 25.5%, clobbering GMA’s new show “Carmela” starring Marian Rivera with only 13.8%. Overall, 13 out of the top 15 most watched programs nationwide in January were produced by ABS-CBN including “Honesto” (29.7%), “Wansapanataym” (28.6%), “Maalaala Mo Kaya (26.5%), “Bet On Your Baby” (25.4%), “Annaliza” (22.4%), “Rated K” (18.7), “Be Careful With My Heart” (17.8%), “Goin Bulilit” (17.2%), and “Maria Mercedes” (15.9%).